Our pals over at Carwow convinced one of their artists, Yasid, to mock up a bunch of rally cars. 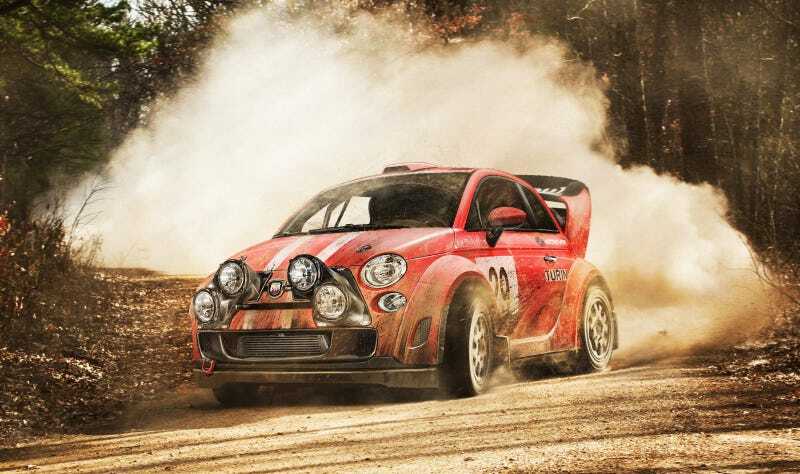 Not just any rally cars, though — the goal was to take the modern re-births of cars that once had rich rallying history (well, mostly), and see how their modern interpretations would look in full rally kit. I think the result is pretty fantastic. Up top, we’ve got the Fiat 500 Abarth. Original 500 Abarths did have a pretty strong, if adorable, racing history. That huge rear wing even sort of looks like the old propped-open engine lids of the original. Alfa Romeo Giulia, in proper Martini livery. At first the sedan-ness threw me, but if I recall, the Lancia Delta Integrale was a four-door as well, and looked great in these colors. That’s pretty close. The Audi TT Quattro is a pretty far cry, aesthetically, from the wedgy hatchbacks of Audi’s early Quattro rallying days, but I think this works well. That wing is huge. I’m told this Mustang rally car was meant to evoke the legendary Ford RS 200. I’m not sure I buy that — the RS200 was much friendlier-looking — but I do think the Mustang works well as a rally car. I notice that side scoop is back — is it cooling brakes? Differential? The modern Delta, pretending to be the legendary Lancia Delta Integrale. I like it, but if I squint, I still see a Pontiac in those lights/grille. Maybe it’s just me. This is a modern take on the S-Class ‘Red Pig’ from 1971. A V12 pig. I’m pretty sure there’s a Porsche 911 outfitted like mostly like this already. Renault Alpine! This one is based on Renault’s recent concept, so it’s a fake rally version of a fake car, if you like recursivity. Rolls-Royce Silver Wraith. This is an excellent potential use for a Wraith. I like that the hood ornament was left intact.